Here is the link for the Promo Update. If you aren't already signed up, please sign up on the right. 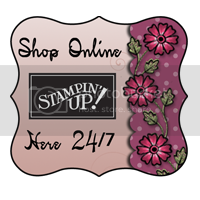 There are a lot of things happening with Stampin'Up! New catalog is coming out on July 1, 2010...only 31 days to go. That means a lot of stamps are retiring, a lot of colors are retiring, accessories (brads, buttons, ribbon, DSP) that have those colors and a lot of NEW items to look forward to. So exciting! If you have any favorites be sure to get your orders in as soon as possible. Things will be available only as the supplies last. I'll have a list for you posted here on June 1st so be sure you check back in. Long time no blog, I know. Too much of life happening. Just got back from TN. My Dad has been under the weather so I have been with him. He is doing much better now and my nephew is with him for a bit. I have some Stampin'Up! news to share with you. As of June 30, 2010 Stampin'Up! 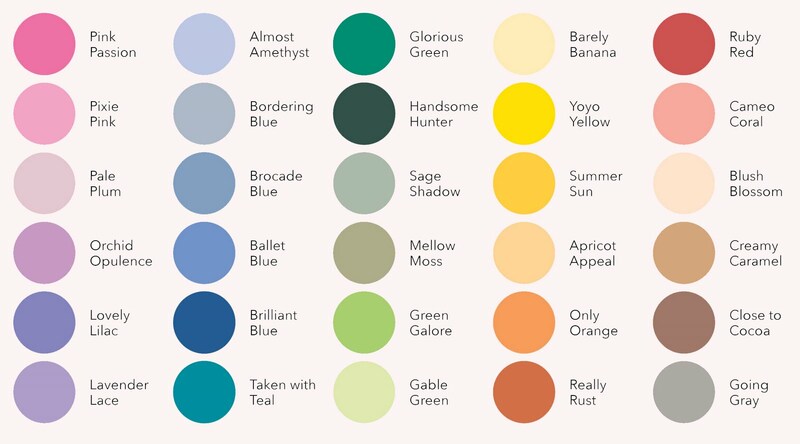 will be bidding a fond farewell to the colors listed below. No more, ink pads, refills, cardstock, ribbon, etc. will be offered in these colors once the new catalog comes out on July 1st. If you are in need of refills, ribbon, brads, etc. in any of these colors you will need to get your orders in soon. Please contact me if you would like to place an order or if you have any questions. Good things are coming...so stay tuned! Happy Monday to you. Well, it looks like we may just get the kids back in school tomorrow. They were out all last week with the snow here in Virginia. Here is a card I created for my daughter and Mojo Monday. Hi Everyone, Saturday February 27th at 2pm I am having a Desktop Calendar workshop. Here is what we will be making. This is taken from a sister demonstrator Jenny Moors of the UK with a few changes. 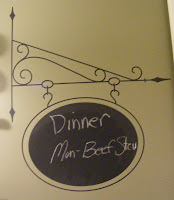 We will be using cardstock and ink Chocolate Chip, More Mustard, Close to Cocoa, Taken with Teal and Whisper White. We will be using the stamp set Circle Circus along with punches, embellishments and the adhesives Tombow Multi-Purpose Adhesive , Stampin' Dimensionals and Sticky Strip. These are excellent! I am very excited about the workshop. If you would like to attend email me or give me a call. Please leave a comment and let me know what you think. I made this with a new download My Sweet Pea Digital Kit for My Digital Studio. The download includes papers, embellisments and stamps. Well, I am almost ready for my very first open house. I am waiting on a couple of more things which should be here by Tuesday and I will be able to post some samples of our make&take. 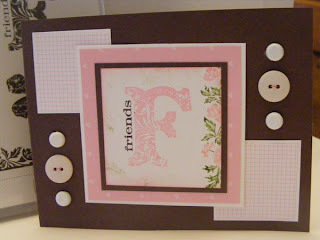 I am so excited about showing some of the great new products that Stampin'Up! has and of course some from the regular catalog. It will be FUN! Have a wonderful night. I hope your 2010 is going great so far. We are already almost half way through the first month. Time does fly doesn't it? 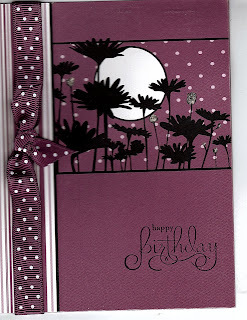 January 5th marked the beginning of Sale-A-Bration for Stampin'Up! 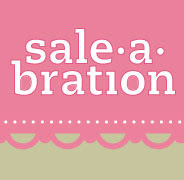 For every $50 you purchase you are able to select an item from the Sale-A-Bration brochure. There are brand new stamps, a great new border punch, paper, etc. If you host a workshop of $300 you get another free item. It just keeps giving and giving. Click on the link to the left to download the brochure and also check out the new Occassions Mini Catalog. You can email me or give me a call and I will get a paper one right out to you. 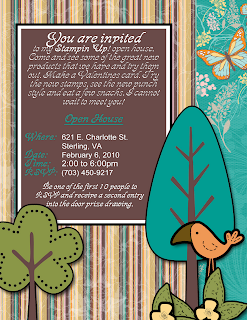 I am having an open house to showcase some of the new products on January 23. Email me if you would like to come. We will have some food and test out some new products with a free Make & Take. Here is a card that I made using My Digital Studio. I had several printed out so that I could just add an embellishment or two, my greeting and send them off. I think these can work for pretty much anything. The first picture is actually two cards open up flat. The top shows the back and the front and the bottom shows the insides of the card. You can see that I added a white area to the inside with a stamp at the bottom so that I may write. I really like how this turned out. 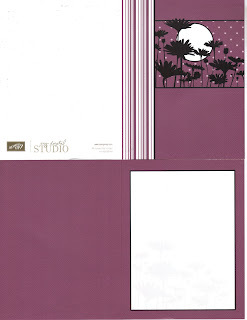 The color is Rich Razzelberry in cardstock and designer paper...ALL in My Digital Studio. I used the Upsy Daisy stamp set and a circle punch for the moon. On the next picture you can see what it will look like with embellishments. The Happy Birthday is from one of the new Clear mount stamps sets in the Occassions Mini. I love this set. Please contact me if you have any questions about My Digital Studio or if you would like to see it in action. It is a great buy. You get tons of cardstock, designer paper, stamps, punches, ribbons, bows, etc. 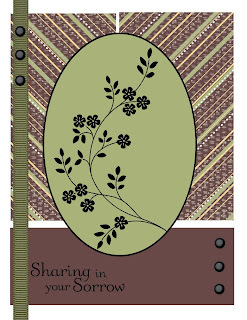 You can make scrapbooks, calendars, cards, videos, etc. They often come out with new products that you can purchase for the system. That's all for now. Have a wonderful evening.